On the last day of my holiday in Korea, back in October 2009, I went to visit Changdeokgung palace. I took some photos of the shops we passed on the way there. To get to Changdeokgung, we walked up Donhwamun-ro, which is a long straight road that leads to Donhwamun gate at the north, the main gate of Changdeokgung. 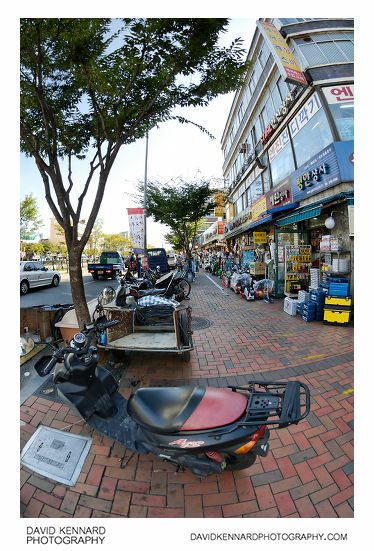 Near Cheonggye stream there was an area with lots of hardware shops. 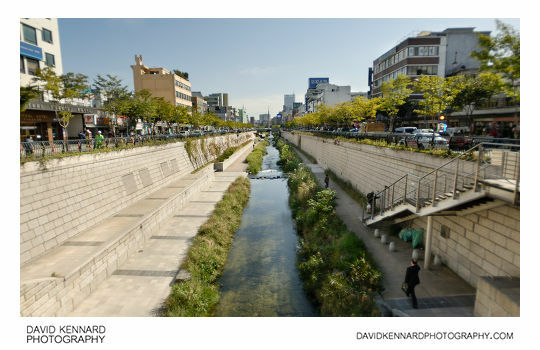 Just north of the hardware shops is Cheonggyecheon (Hangeul: 청계천; Hanja: 淸溪川), a stream that runs through central Seoul. The stream was previously covered with roads and had nearly run dry, until it was rennovated to its current state in a $900 million project that started in 2003 and was completed in 2005. It's quite a popular area where people come to relax, and children enjoy paddling in the shallow water. For the photo above, I accidentally had the aperture set wide open, so the photo isn't very sharp. 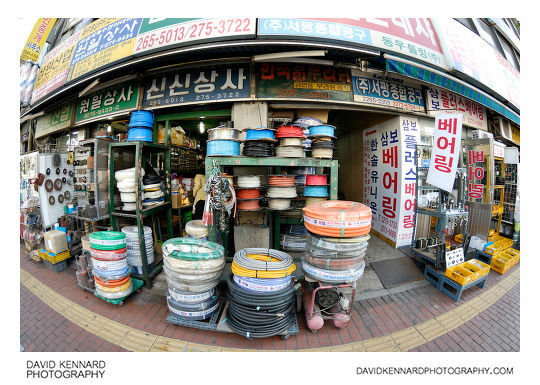 I was using my Tokina 10-17mm fisheye lens, which needs to be stopped down a bit for good results. 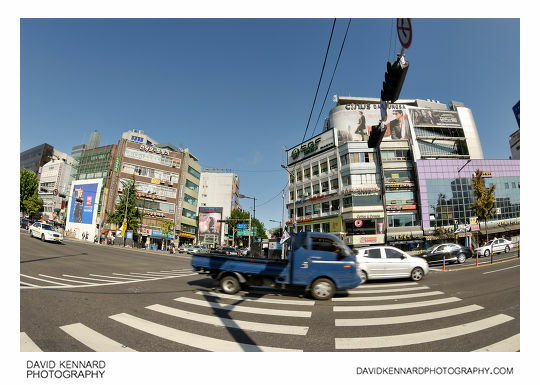 A bit further on we crossed over Jongno (Hangeul: 종로; Hanja: 鍾路), a large wide street that runs east-west through part of central Seoul. Across the road you can see the large 7 screen Dansungsa cinema. 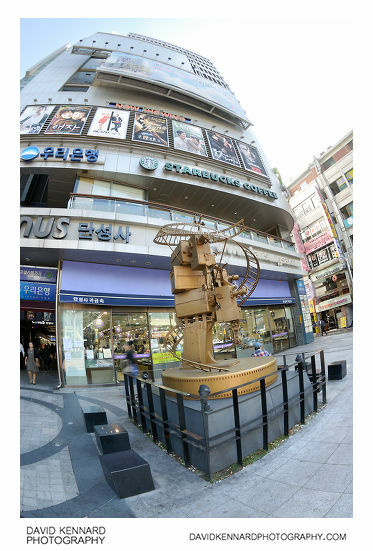 Outside the Dansungsa cinema is a large sculpture of film cameras with unwinding film wrapping round them. Dansungsa (Hangeul: 단성사; Hanja: 團成社) was the first cinema to open in Korea, back in 1907. The original owner of the cinema helped develop the Korean film industry, which is today quite large. with more Korean films being watched in Korea than Hollywood films. Down one of the sidestreets you could see a temple, so we went to have a look. 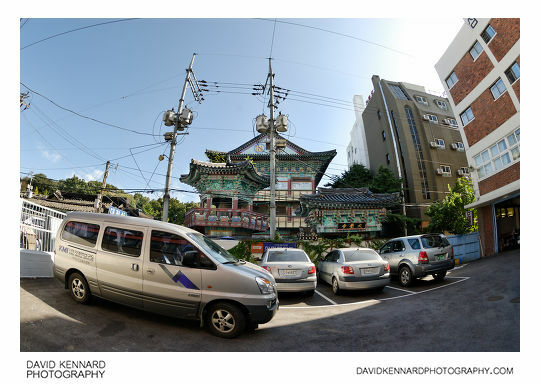 Unfortunately the side street only went to this car park, so you couldn't get a very good view of the temple. The temple is called Daegaksa (Hangeul: 대각사; Hanja: 大覺寺) and is part of the Jogye Order of Korean Buddhism, like Jogyesa temple, which we had visited the previous day. 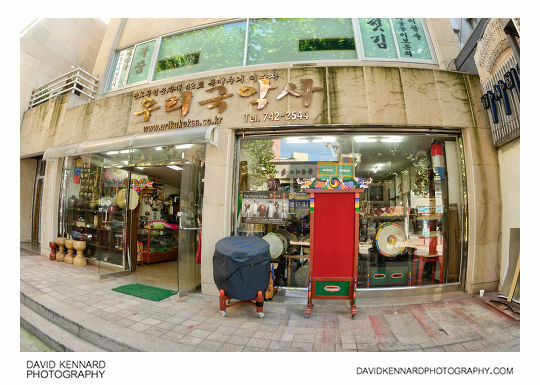 Carrying on along Donhwamun-ro, we passed this shop selling traditional Korean musical instruments. 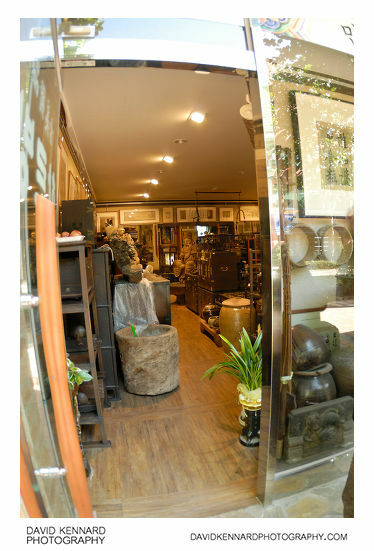 The name of the shop is Hareubang Antiques shop (古美術品 하르방). 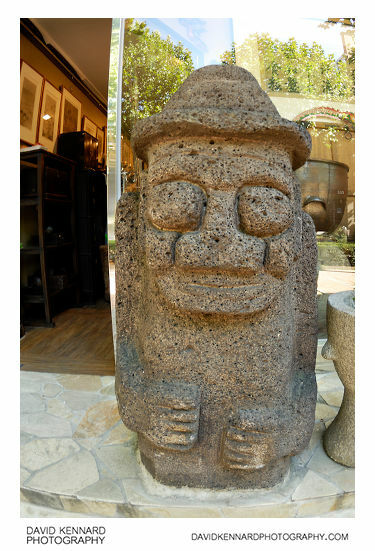 Dol hareubangs are stone guardians from Jeju Island, off the south coast of Korea. They were used to protect villages from evil spirits. 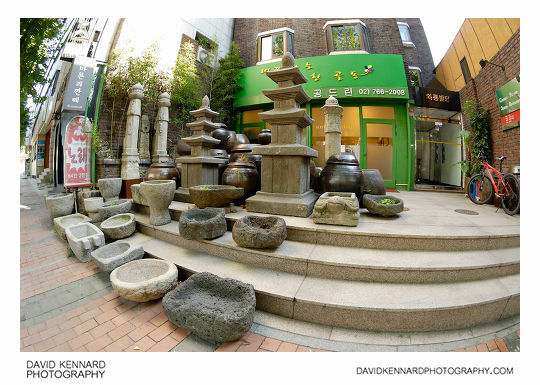 A bit further on, this antiques shop had a lot of stone sculptures and earthenware onggi jars for sale outside. Then a little further on, and we got to our destination, Changdeokgung Palace.